I feel I have been neglecting the blog recently. Not out of choice or dislike. But mainly because, life. Ever wondered how to make your French Toast even more French? Short of dressing it in a beret and having it recite “Oui, oui, oui! I am ze Toast Français!” in an impeccably Parisian accent, switching out the usual white bread for croissant is a great way to get started. The airy, buttery goodness of a croissant makes for a fantastic little twist on your standard French Toast fare. Add to that some flavourful strawberries and you have a sweet brunch option that you’ll no doubt keep coming back to. I know I say this a lot, but seriously where has this week gone? Time is going by at an alarming rate at the minute, I want to grab it by the reigns and pull it back, ever so slightly, to a gentle trot. My weeks are all blurring into one and it’s gonna be half way through the year in no time. They say breakfast is the most important meal of the day. It’s certainly my favourite meal (alongside dessert!). But not everyone has the time to cook a delicious breakfast every morning. And if you do have a delicious breakfast every morning, the things that make it delicious are probably things you shouldn’t be eating every morning. What’s the solution? Here’s one. Put down that bowl of honey-sweetened-frosty-flavoured-rainbow-coloured Fruit Loops. This is not only a tasty way to start your day, but it’s healthy and takes almost no time to prepare in the morning. A couple of weeks ago I was lucky enough to attend one of my favorite food fundraising events in San Franciso. Taste of the Nation featured over 60 restaurants and raised $225,000 to help feed hungry children in the U. S. $225,000 is huge! That’s over 2.2 million meals for children who need it most! 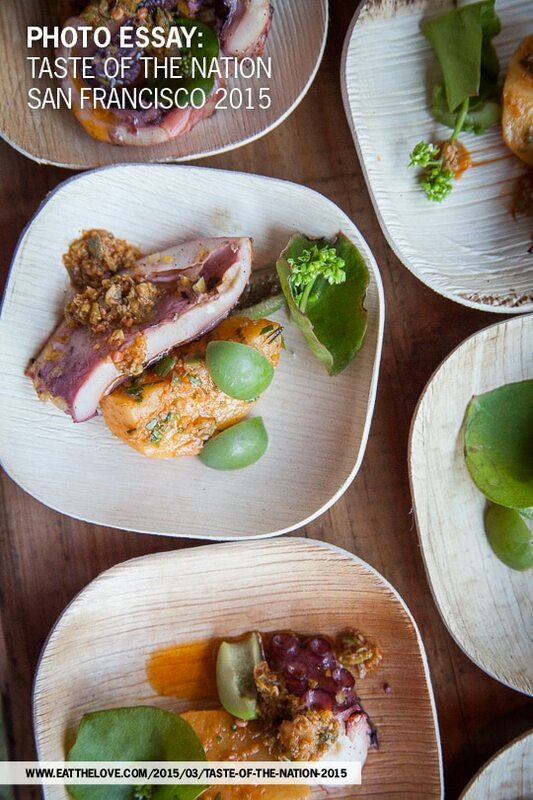 Here are some highlights of the gorgeous and fabulous food featured at the event. Or. The Day Boulud Stole Food from Me. Named after Daniel Boulud, a Michelin-starred chef based in New York (though recently his main venue – Daniel – lost its third Michelin Star), Cafe Boulud is as upscale as it gets. Decorated with a brazen finesse, it is situated in the Four Seasons Hotel in the Yorkville area of Toronto. Wow, spring and sunshine are finally with us so I grabbed some nice local lamb chops which I served with a beetroot, mint and fresh sheeps cheese triangolo. Accompanied by a watercress salad it made the perfect lunch with a glass of vino. For this you need 6 chops, 6 mint leaves, a cup of mashed potato, 2 boiled beetroots, and a 100g lump of fresh sheep’s cheese – Greek feta is easier to procure than an Italian alternative and is, I think, even better for this dish.